Ethnic Genealogy is the first inclusive work that covers several ethnic minorities and provides more general information as well. Family researchers or librarians will find this comprehensive, user-friendly work invaluable. [This work] will be useful to librarians, to genealogists, and to persons searching American Indian, Asian-American, black American, and Hispanic-American ancestries. Each chapter has thorough documentation, annotated bibliographies, and, in some cases, lists of periodicals, directories of societies and repositories, etc. – Reference Books Bulletin. Although a number of books have been published on genealogical research, this book … brings together in a single sourcebook research techniques, a bibliography of published and unpublished sources, descriptions of library collections, addresses of genealogical organizations and societies, and other sources and strategies essential to the successful pursuit of ethnic genealogy. This work is designed as a one-volume reference tool for librarians, researchers, archivists, amateur and professional genealogists, and readers interested in ethnic history and genealogy. For the experienced genealogist it complements and extends other books in the field; for the novice and the librarian it provides a firm grounding in the techniques of ethnic genealogical research. Jessie Carney Smith is a published author and editor of young adult books. Some of his published credits include: Ethnic Genealogy: A Research Guide (Hardcover), Black Firsts: 4,000 Ground-Breaking and Pioneering Historical Events (Paperback) and Epic Lives: One Hundred Black Women Who Made a Difference. Tracing ancestors as far back as possible has brought to many people great satisfaction and pleasure. Even documenting one’s family thoroughly for but a few generations can prove just as exciting and fulfilling as a more sketchy documentation across two or three centuries. Each individual ancestral relative previously unknown and genealogically discovered is its own special thrill! No less thrilling is the discovery of records rich with information, which would have remained untouched, which would never have come to light, unless you had gotten caught up in the multiple, magnetic lures of genealogy. Young and old alike find that knowing one’s roots, and thus coming better to know who one is, provides a personally rewarding experience. But even more is involved than uncovering a family history, for each discovered United States family history becomes a newly revealed small piece of American History. Stated simply: a nation’s history is only the collective histories of all its people. It is only through an unfolding of the peoples’ histories that a nation’s culture can be studied in its fullest meaning. Serious search for one’s roots requires strong dedication; genuine longing to unfold the past; some would say a nigh-fanatical pursuit of each lead The result is a sense of fulfillment as ancestors become real, coupled with a sense of disappointment because yet so much remains unknown. Moreover, one’s pleasant, comfortable, and regular routines must be altered, if not sacrificed, in order to submerge one’s self in libraries, archives, and other repositories of information. Finally, there must be a deep commitment and sense of purpose, which must not diminish until the final lead has obviously been exhausted. Even then, the serious genealogical researcher must retain an optimism—a real hope that one day may present some brand-new lead to be explored to the fullest, of course. Indeed, optimists rather than defeatists have produced the results for which serious genealogical research is best known. Every genealogical researcher shares one frustration that I know I will always live with: Was there something else I should have uncovered? My long curiosity about my family’s roots and the twelve years of obsessively pursuing and writing about them surely have not ended my curiosity. Again, put simply: I have learned to live with my genealogical addition. 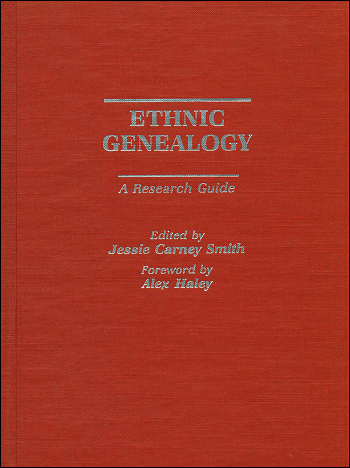 Among the reasons that I so sincerely admire and endorse Ethnic Genealogy: A Research Guide are that it encourages others to develop this most positive addiction; and this volume also guides and instructs one in some of the ways to truly enjoy coping with it. My book Roots likely would never have been realized without conscious assistance from some living family elders and, I truly believe, an unconscious inspiration from ancestors in their graves. Oral history, the telling and retelling of family stories, was practiced throughout my family’s generations; the elders fed the interest of their children and their grandchildren in continuing the tradition—this is how the stories finally reached me. I feel that our tradition passed along the family historian role to me, who happened to be a writer. Somehow as a writer I felt that a book fusing the history and the genealogy of the Kunta Kinte family in Africa and then in America might have some impact. But I repeat: It never could have happened unless our family’s earlier generations had preserved our history orally. So that’s another reason why I praise Ethnic Genealogy: It promotes oral history and family history as solid, valid genealogical research methods. The authors rightly stress the importance of talking with older family members and recording all possible information now, while they remain with us. Moreover, Ethnic Genealogy illustrates how oral and written family records can attest to ancestral family unity. Many people assisted my Roots research, none more than the genealogists and librarians, who often seemed as obsessed with my roots as I was, as they helped me to pursue clues and to document my forebears. They simply helped me to illuminate my family’s past. This volume pays tribute to these professionals, acknowledging that, without them, successful genealogical search ranges from difficult to impossible in some cases. Nonetheless, Ethnic Genealogy is an assistance tool not only for genealogists, but also for librarians and researchers desiring to hone their skills in this particular specialty. Genealogists, librarians, and researchers sometimes have experienced appreciable differences in their individual approaches to research challenges and even in their appreciation and respect for each other’s professions, but Ethnic Genealogy clarifies these groups’ common interests and shows particularly how, united, they present an incomparable resource for the amateur and professional genealogical researcher. Ethnic Genealogy is not only timely, it is necessary. Had this work appeared long before now, many a genealogical researcher could have experienced far less frustration. Now, this volume can immensely aid countless researchers who are just beginning their search, or others who have become muddled and confused in the pursuit. The authors describe the special research approaches that should be observed in these specific ethnic quests, along with some of the classic pitfalls that ethnic specialty researchers may expect to encounter, and demonstrate that American Indian, Asian American, black or Hispanic genealogical research can be successfully pursued. Basic research steps are discussed for each ethnic heritage. Several of the authors remind us how the work of family historians has led to many family reunions—an event which I strongly endorse. This single reference volume lists and describes libraries, archives, and other repository sources of data in selected sites across the United States. The authors note that some records are accessible regardless of one’s location. At least two of the authors discuss records beyond American shores, especially important for Asian American and Hispanic research. Finally, Ethnic Genealogy surely will spur many new genealogical searchers along their way, thus making a significant and healthy impact on many families. Together with being vital to any well-rounded genealogical collection, this work is an important text for courses in family history, genealogy, and ethnic culture. It is, in fact, a volume that will balance anyone’s personal library. ~ Alex Haley, Los Angeles.